A cut, slice and stab above the rest. Let me just get one thing off my chest right off the bat before I begin this review proper. Gun Media – the folks behind the Friday the 13th multiplayer game – should really take some notes. I’ll go into further detail but my goodness; the amount of interchangeable weapons, outfits, and kills Blue Wizard Digital crammed into Killer Puzzle is staggering. With that said, let’s move on to the review. 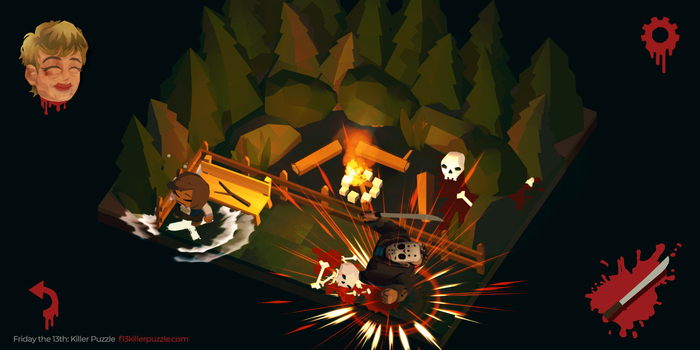 Friday the 13th: Killer Puzzle is an isometric top-down puzzle game cut from the same blood-stained cloth as its predecessor Slayaway Camp – Blue Wizard’s first foray into lighthearted horror game (yes, that is a thing) territory. 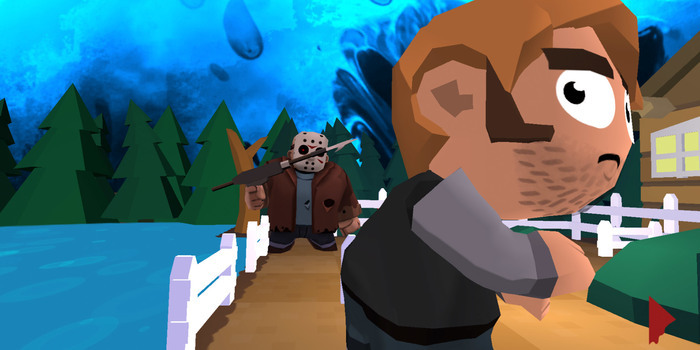 You take control of Crystal Lake’s infamous hockey-masked slasher and slay your way through a series of levels plucked from Jason Voorhees’ grisly cinematic history. Controls are limited to sliding the drowned mongoloid boy turned killer across a grid until you come face-to-face with a hapless teenager…at which point Jason does what he does best. Once you dispose of (i.e. decapitate, dismember, disembowel…toss a bookcase on top of) your targets, the proverbial Final Girl..or boy, or person will appear on a designated ‘X’ marker on the map. You final kill is treated to a timed button-press scenario where you have an opportunity to watch a brutal cutscene play out if successful. It is a silly, yet incredibly satisfying way to end a puzzle. The game plays out alongside the loving guidance of your mother’s decapitated head. She offers a whole lot more than encouraging remarks and praise for her special, special boy, however. She also dispenses valuable words of advice (such as alerting you to a environmental gameplay mechanic/gimmicks), hints (by means of telling you which action you should take first), or even going as far to show you the level’s solution. It’s all for the greater good of netting you with more kills. Kills are more than just to satisfy gore-fiends (and believe me, you will be more than satisfied). Murdering teens increases your bloodlust. Maxing out said bloodlust increases your rank and awards you with a random weapon to play with. Kills are also tied to the game’s many unlockable outfits. As you play new obstacles are introduced. For example, the second level has Jason going to jail (as if he could contained!) In addition to the inmates – which are your primary targets – the map is also littered with security guards. Approach these guards head on and Jason will be busted, and it’s game over. So you always have to mindful of what each map gives you to work with. 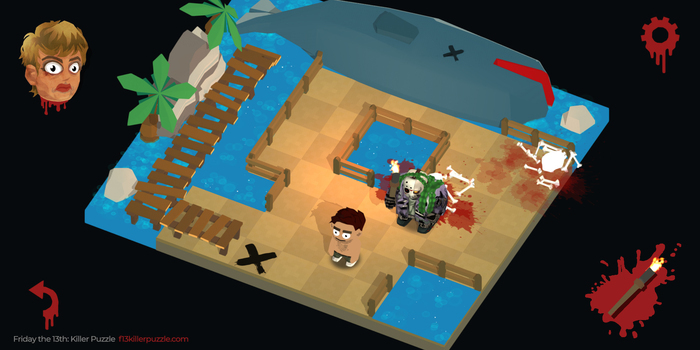 Environmental hazards such as bear-traps and open bodies of water are a double-edged. While you can scare the teens into these insta-kill areas (though it is a whole lot more satisfying to kill them yourself), traps can end your life as well. Luckily there is a Rewind feature which lets you undo your last action in case you mess up. There is a Redo button which lets you start and entire level over from the beginning if you feel you messed up to the point of no return. I was taken aback by just how much content was crammed into a game built for a mobile platform. For starters there are the levels. Each of the game’s 10+ levels is divided into 13 maps , each landscape more varied and detailed than the next. From New York to NASA, Blue Digital Wizard has taken the very best of Jason’s silver screen stomping grounds. Aside from the main puzzle mode, you also have to option in doing a Daily Challenge. Complete a streak of 13 challenges and you net you a super fancy loot box that undoubtedly holds a badass weapon in it. There is also a Murder Marathon mode. This mode takes the timed button-press mini-game players encounter during the final kill of each map and turns into an endless mode. It’s a fun distraction and actually a way quicker way to increase your rank. 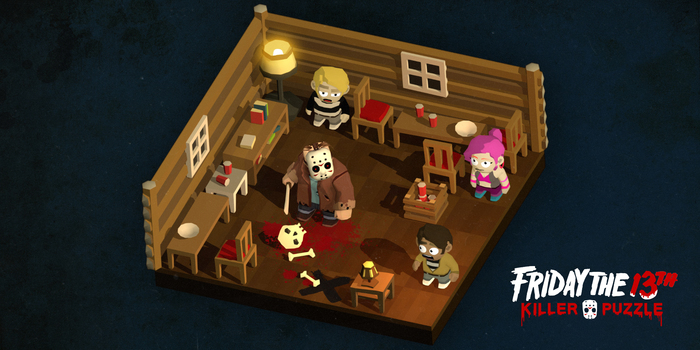 Friday the 13th: Killer Puzzle is a definitive must-buy for horror fans. It doesn’t drastically deviate from the formula is established in Slayaway Camp, but it doesn’t have to. The adorably animated cries and screams are well worth the price of admission. Steam code was provided by Blue Wizard Digital for review. Co-Host of Nintendo Duel Screens Podcast. Game Stuff 35 – PAX East!!! !